The first step is to come to a few rehearsals and sing along with us! We offer guest books filled with sheet music. Can’t read music? No problem! We also have audio tracks with which you can learn the music! The second step is to prepare what’s known as a “polecat”—a very common barbershop song. Our director will listen to you sing and determine what voice part is best for you. Once determined, you will need to practice your voice part on a polecat. Once prepared, you’ll be asked to sing in a real live quartet in front of our director! It’s just that easy! 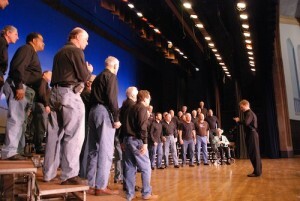 Once a member, you will be asked to pay modest dues to the Chordsmen and the Barbershop Harmony Society. You will also need to procure all the necessary costumes and uniforms. If you are interested in joining or would like to learn more, be sure to go to our contact page and submit your information!